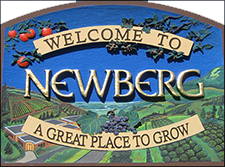 Newberg, the second largest city in Yamhill County, is located about a mile north of a northerly bend in the Willamette River. The city is located in the eastern part of the county, about twenty-three miles southwest of Portland and fourteen miles northeast of McMinnville. The development of Newberg illustrates the growth of the Willamette Valley as an agricultural region in the nineteenth century and the expansion of Portland’s economic reach in the twentieth century. Newberg is considered a gateway to Willamette Valley wineries and is convenient to the Ribbon Ridge, Chehalem Mountain, and Dundee Hills American Vinticultural Areas, which have attracted high-end tourism facilities such as the Allison Hotel and Spa. The city is also home to A-dec, which each year since 2003 has been judged the world’s best manufacturer of dental equipment, furniture, lights, and delivery systems. Founded in 1964, the company employed over nine hundred people in 2016.